Whether you are a regular to the slopes or have never skied before, why not join us on this fun-filled weekend at the Snow Centre? Experienced skiers can brush up on their technique ahead of the winter season, or beginner and novice skiers can try their hand with an included 2 hour group lesson. After checking into our hotel we can spend the afternoon enjoying our hotel's leisure facilities, which include a gym, indoor pool and Jacuzzi. Later, we can meet our fellow passengers and Solos Tour Leader for a welcome drink and some dinner, and discuss all things ski! The following day we can look forward to an action-packed morning on the slopes. After breakfast we can take the short minibus transfer to The Snow Centre, where (depending on our ability level) we can join either a 2 hour group lesson for beginners and novices or enjoy a 2 hour ski pass where we are free to practice our skills ahead of the winter season. Afterwards we can look forward to an informal “Après-ski” in the Snow Centre where we can enjoy a light lunch with views over the slopes. 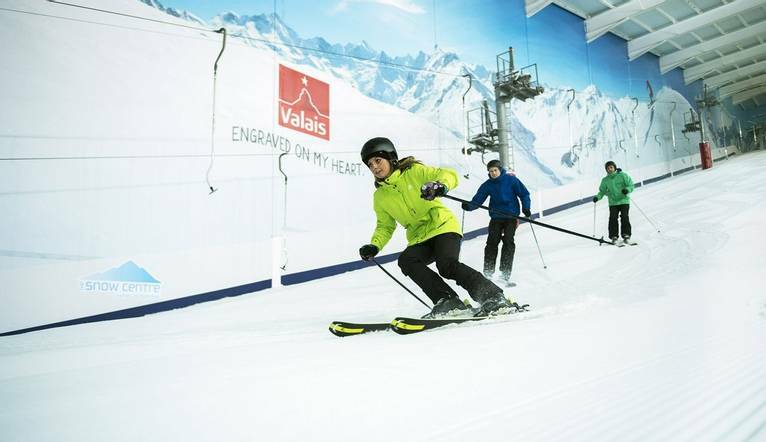 The UK’s newest indoor ski centre offers a huge 160m main slope and is the largest indoor ski slope in the UK. Both slopes are over 30m wide and maintained with the perfect snow surface – ideal for our indoor skiing and snowboarding needs! Jane made everyone welcome and was great at organising everything. The Ski snow centre was brilliant. The hotel is conveniently located just 5 minutes from the M1 and only 10 minutes from Hemel Hempstead train station. There is free parking available at the hotel and free Wi-Fi available throughout. Our comfortable hotel boasts a health club with a Jacuzzi, indoor pool and fitness centre and you can even pamper yourself by pre-booking a beauty treatment (extra charges may apply). Dining facilities include a buffet restaurant for breakfast and dinner restaurant plus a cocktail lounge. Room facilities include a pillow menu, ironing board, safe, hair dryer, mini bar, complimentary tea and coffee making facilities, 24-hour room service and flat-screen televisions (extra charges may apply). You may either take the 2 hour group ski lessons or enjoy a 2 hour ski pass. Whatever you preference your Tour Leader will be available to help organise your skiing. On this ski trip, dress is generally very informal, the emphasis being on comfort and warmth. We recommend that you take a pair of skiing trousers and warm ski jacket or a waterproof shell and separate fleece lining or an all-in-one ski suit. Skis/snowboards, boots and poles are provided. We suggest a Group Collection to cover transfer drivers, and hotel staff of £5 per person. Your Tour Leader will collect this on your behalf and distribute it accordingly, thus relieving you of the burden of who, when and how much to tip. The tipping of housekeeping will be left to your individual discretion (a small amount left in your room on departure should cover this and would be much appreciated). As is customary, ‘the hat’ will be passed around for the driver and guide on all optional excursions. For any meals that are not included in your itinerary, or taxi fares, your Tour Leader can advise of an appropriate add on.